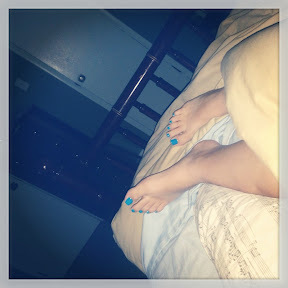 I forgot to mention last night that I painted my toenails but I painted them too close to bedtime so I had to spend the first couple of hours in my bed with my feet hanging out of the covers. I just start with my sleep patterns tonight because it really does lead into today. I woke up this morning on time, whoo wooo, and I was exhausted. I dreamed I was on the Biggest Loser and I had worked out all night long. I have been watching old seasons of the shoe, because I love it, and I must have had it on my mind. I was pooped when it was time to get up. When I got to the gym to meet my running friends I went ahead and let them know that I had been working out with the last 6 hours and I was pretty tired. I did struggle a little with today's run, Thursdays are generally not my best because by the time Thursday rolls around my legs are done! But today even with sore legs we managed to get in 5 miles in an hour. For me that is a great time. I am hoping to get to 6 miles an hour one day.... I was still a touch slow for the others but they were good and stuck with me. After my run I was off to the doctor. For starters I didn't eat any breakfast cause I thought there would be blood work today and I was right, this is important for later. I needed to get my hip checked out finally cause its been hurting for a while and I have searched possible problems for so long that I have given myself cancer again. Yes, again! Today I went to see a new doc and I was incredibly pleased. She was so nice and listened to me and touched me. That is more than I can say for my last doctor. She also ordered some blood and lab test. I was overly pleased. She didn't think I had cancer....yes!! but checking none the less cause I had pretty well convinced myself (for any new readers this is a regular thing for me but it does stress me out pretty bad and I get all worked up about it, every time!) so we will know when those test come back. I also got my hip x-rayed since I was told by an exercise physiologist about a month ago that it sounded like I had a stress fracture. 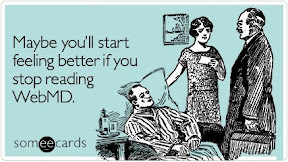 (I don't recommend this but I completely ignored his suggestion until after my triathlon because I really wanted to do my race) But the hip has not been feeling better so I needed to go, I have had the appointment since before the race. We also flirted with the idea of a hernia and a pulled or strained muscle. Once this first round of test come back we will know what to look at next. Again, I really liked this new girl and hope to continue to see her. Now if we can just get this hip to stop hurting it will just get better! Once the appointment was over I was starving. We were well into lunch time and I hadn't put a bite to eat in my mouth. When I get this hungry I don't usually make good decisions and I did not make good decisions today. Uh, I have already been feeling fat and a day of bad eating is not what I needed. I was able to salvage most of the day but the decisions made in a fit of hunger were not the best. I have tried to relax a little bit about my food/diet. What I have been doing has been working so why am I trying to change things up? I just need to relax and remember what the main goal is here. The goal is not to be "skinny" the goal is to be healthy and strong and fit and improving and athletic and lose weight in the process. I just needed a good swim to get my mind right and get my goal back into perspective. I swam tonight in the Cone of Awkwardness so I was trying to think of anything but what was going on in the lane beside me. A family came in to swim, mother on the side and dad and daughter in the water. They fought and argued the entire time. I think there might have been some mental challenges involved but it was still awkward and I didn't want to stare but every time I got close they were yelling at each other. I don't like to be around people fighting in general and I get uncomfortable instantly, parent/child, husband/wife it doesn't matter its odd. Thankfully when they came in I was close to finishing up my swim so it motivated me to swim a little faster than normal. My belly was kinda wonkey during my swim, much to the part that I ate like crap today but I was still able to do it and burn my calories. Now I'm going back to my old eating habits with more protein supplements to recover after workouts and maybe a little less stress about the number of calories in and out and more about fueling for performance! And now I have to focus on sleeping for performance. Night guys!